I've been on a bit of a roll lately, a muffin roll to be exact. 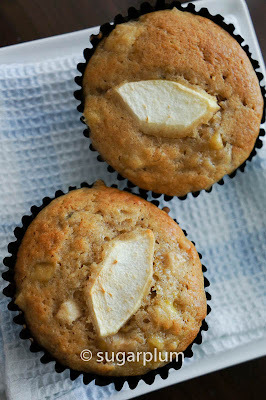 After the goji blueberry muffins, and the banana muffins, this time it's banana apple muffins. Over the last few weeks for some strange reason, we had plenty of bananas in the house (the fruit, not manic humans). I guess the neighbourhood market was selling them on the cheap. Incidentally, the most expensive bananas I'd seen were in Sydney in 2006. AUD10! That worked out to AUD2 per banana - I almost fainted in Coles. Coming from a country where banana trees are a dime a dozen, and bananas equally cheap, paying so much for bananas was just mind-boggling. I think they were expensive because Australia was plagued by a severe drought at that time. This recipe is a variant on the banana muffin recipe. 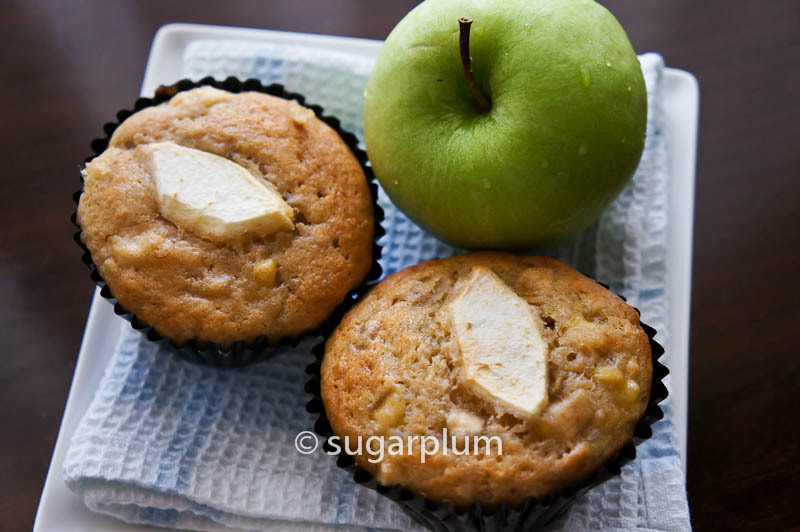 It produces a moist muffin because of the apples. They are good eaten on their own as the baked apples add a nice flavourful sweetness to them. Who says you can't have healthy and tasty at the same time? Method :1. Preheat oven to 190c and prepare muffin trays with liners. 2. Melt the butter in the microwave oven and leave to cool. 20 seconds on medium-high is normally sufficient. 3. Mash the bananas. Peel, cored and dice the green apple. 4. In a large bowl, sift the flour, baking powder, soda and ground cinnamon. Add the sugar and mix well. 5. In a second bowl, mix the eggs, milk, honey and vanilla extract. 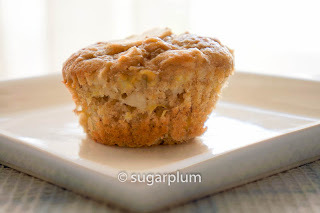 Stir in the mashed bananas and diced apple. 6. Make a well in the center of the dry bowl and stir in the egg/milk/fruit mixture. Don't over mix. Batter should be lumpy. 7. 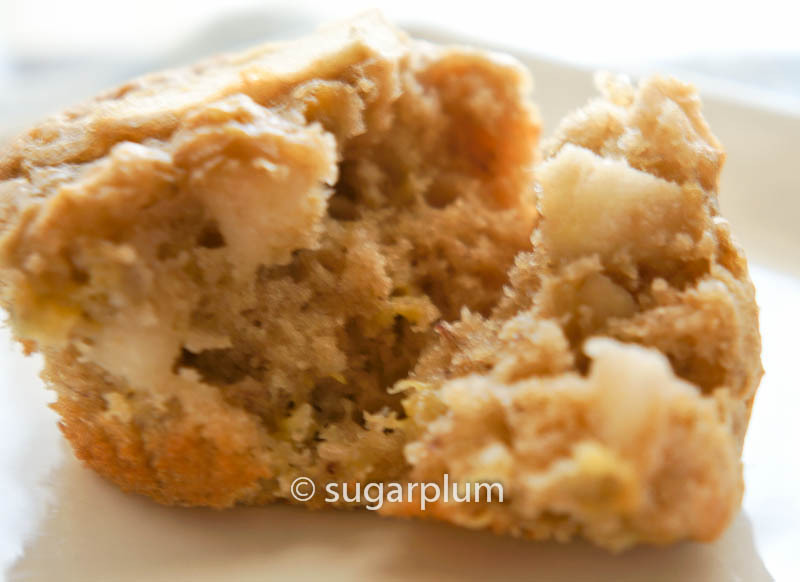 Scoop batter into muffin tins, about 3/4 full and bake for 20 - 25 minutes. 8. Bake for 20 - 25 minutes. Use a skewer to test for doneness. Cool 5 minutes in tin before removing.